BookingWizz for WordPress – is long awaited addon which will allow you to integrate bookingwizz into your wordpress site without any hassle. 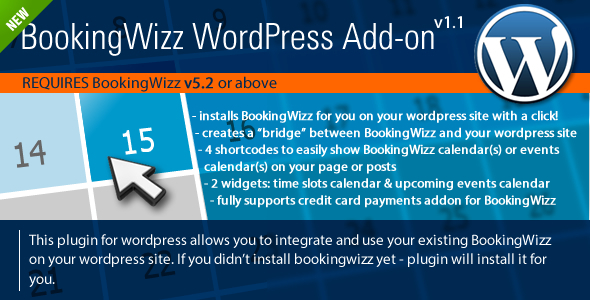 Plugin will install bookingwizz for you (bookingwizz must be purchased and uploaded to your site root) with a click and will seamlessly integrate whole system interface into your wordpress site, you will not have separate login to manage your events/bookings/calendars. BookingWizz for WordPress has 2 widgets and 4 shortcodes at the moment. 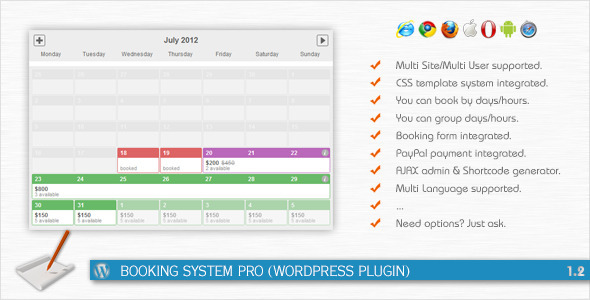 This Plugin will help you to easily create a booking/reservation system your WordPress website or blog for any purpose. The JS-Appointment WordPress plugin is a professional automation tool allowing your guest the freedom to book appointment on your website 24 hrs a day which in turn will free up your valuable time. The Reservations Calendar plugin allows users to ‘rent’ a time interval on specific dates using PayPal. JS Property is a powefull WordPress plugin for creating and managing real estate business site, with option to sell or rent properties (with availability calendar and booking form), agent profile support for agencies or single owner, frontend access, Paypal gateway, individual contact form. Packed full of features (15 widget, 3 sliders, list page,details page), it gives you possibilities that no other real estate system for WordPress does. Try it out, you will be impressed. The Power Of Fostering Pull For web Applicaton.